LEARN HOW TO BECOME A BETTER LISTENER!!! This will give you the techniques and undertanding you need !!! Become a better listener by using hypnosis to help you develop those specialized skills that turn hearing into listening. Most people do not listen to the best of their ability because they are already thinking about what they will say next once the speaker stops talking. Likewise, when listening to a lecture or something on the radio, we are actually only absorbing a small fraction of the information conveyed. Hypnosis is able to help with focus and therefore true listening. 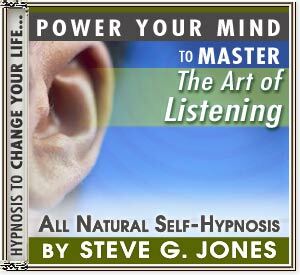 "Be A Better Listener" is a self-hypnosis program developed by Clinical Hypnotherapist, Dr. Steve G. Jones M.Ed. By using the program for 21 consecutive nights, you can become a more sensitive and skilled listener.